Join the Fellowship of the Ringing Cedars USA, LLC! Become distributor of The Ringing Cedars books and help spread the word! Whether you are an individual willing to order a few copies at preferential prices to give to friends or a large book distributor (or anyone in between!) we will be happy to hear from you and do business together. Please e-mail us at info@ringingcedarsusa.com with any questions or offers! The world needs the Ringing Cedars to be widely available in English, and we can work together for our common good! Book 1 "Anastasia" was released in February, 2005. Book 2 "The Ringing Cedars of Russia" was released in May, 2005. Book 3 "The Space of Love" was released on September 14, 2005. Book 4 "Co-Creation" was released in April, 2006. Book 5 "Who are we?" was released in November, 2006. Book 6 "Book of Kin" was released in April, 2007. The first Russian edition of "Anastasia" sold over 100,000 copies through individual distributors even before it became available in the bookstores! There is no reason why we should not do the same with the English translation! We are now building a network of individual distributors in North America, Europe and all over the world, as The Ringing Cedars books are ideally suited for distribution face to face, at local events, or in a club setting. We offer our distributors a very attractive Discount schedule with generous discounts off the list price. We can ship the books world wide. Once you place your first order with us, you are entered into the on-line directory of our distributors, and your potential local customers will be able to find you through our web site! For promotional purposes, you will receive 1 free poster for each box (64 copies) of the books you order. You can purchase additional quantities of the posters at only $0.99 per copy. Please contact us at info@ringingcedarsusa.com with any inquiries, offers and your bright marketing ideas. We will be happy to have you as our distributor! Orders pre-paid and non-returnable, unless otherwise negotiated. If you want to order significantly more than 1000 copies or have any questions, please contact us at info@ringingcedarsusa.com for details. You can order any quantity to be shipped anywhere in the world! in Asia / Middle East: China, Hong Kong, India, Israel, Japan, Malaysia, Singapore, South Korea, Taiwan, Thailand, Turkey. If your country is not in the list above or if you cannot / prefer not to pay with a credit card or PayPal, please e-mail info@ringingcedarsusa.com for additional information and payment options. Use this form to pay be credit card / PayPal. To pay by check, money order, or wire transfer, please e-mail info@ringingcedarsusa.com for payment instructions. STEP 2: SHIPPING COST. Within 24 hours we send to you the best rate for shipping on your order. After your approval we will send to you bill for shipping cost. After your payment of the shipping cost, we immediately send your order to you. 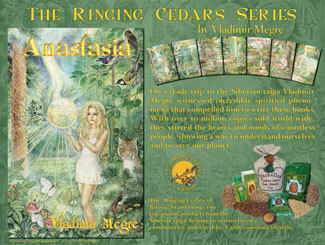 Authorized Distributor of THE RINGING CEDARS OF RUSSIA books and products.